When I graduated from high school, one of the first things my dad did was take me to a Dave Ramsey seminar. Being an 18-year-old “man” with my entire adult life ahead of me, I wasn't crazy about the idea of spending an entire Saturday listening to someone yell at me about getting out of debt and saving for retirement. Nevertheless – my dad seemed to think it was important, so I went along. At the end of the day, my mind was blown – I walked away from that seminar with a radically different outlook on my financial future. It was one of those rare, life-changing experiences where all the information instantly resonated with me – simply because I knew it was true. The real significance of this illustration is that it shows the power of starting early. When a person starts saving for retirement at a young age – their end result will FAR EXCEED a person who starts later in life – even though the person who started later will have invested far more principal over the long haul. The paradox of the situation is that most 18 year olds couldn't care less about saving for retirement – it's one of the last things on the mind of a young person (especially when they don't have such an obvious illustration showing them what to do). I was extremely lucky because when I first saw this illustration, I was 18 years old AND I decided to implement it (and I've been maxing out my Roth IRA almost every year since then). Some people try to downplay this illustration with the argument that a 12% ROI over the course of 40+ years is totally unrealistic – but even with a less-optimistic assumption about your average return on investment, the undeniable power of compound interest remains the same. Most of the retirement calculators on the internet assume that your money is getting plugged into a mutual fund (or some other investment product that you don't have to think about). While it's certainly nice to invest in something this easy – there is also the potential for far higher returns if you're willing to deal with a slightly more complex investment like real estate (and the ups and downs that come with it). So what would an investment calculator look like if we applied it to real estate instead of the stock market? How much you're willing/able to invest. The ROI you're able to get on each new property. If you don't already know the answer to #1, check out Tim Ferriss' monthly expense calculator to get a better idea. On average, your goal is to earn a 15% cash-on-cash return on all the properties you buy during your active investing years (and if you're buying the right properties, a 15% ROI should be feasible). As explained in this post, a property's ROI is calculated as the property's gross income minus any/all expenses, vacancy, property management costs, mortgage principal, interest, taxes, insurance costs, etc. You will be financing all of your properties with 30-year mortgages at an interest rate of 5%. After 25 years of investing $5,000 annually, you will STOP all new investment and instead, you will start siphoning off half of your 15% returns to cover your living expenses. The other half of your 15% ROI will continue to be reinvested into your portfolio. As such, your real estate investments will continue growing without any new principal investment from you (so in theory – your income will continue to grow and will support you indefinitely). 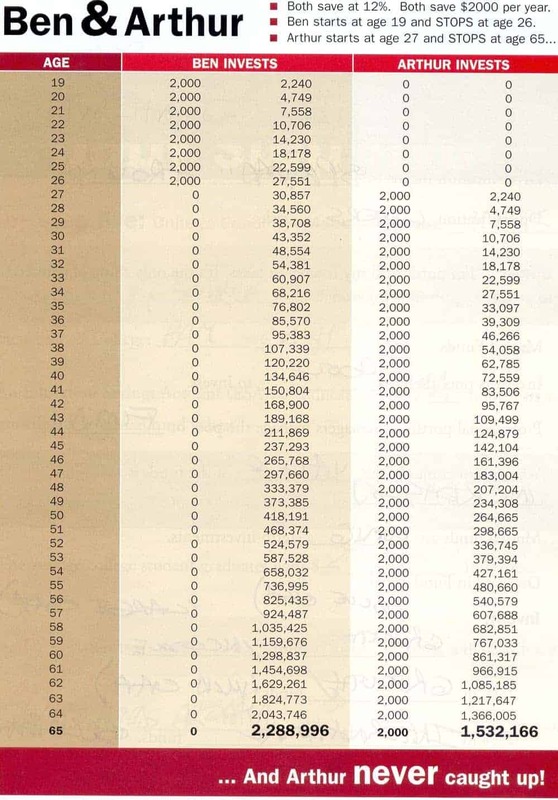 Timeline: This is showing the number of years that you are actively investing in your real estate portfolio (i.e. – if you were 18 years old in Year 1, you would be 78 years old in Year 60). Principal Investment: This is the amount of new principal (outside money, directly from your pocket) you are investing in your rental property portfolio each year. 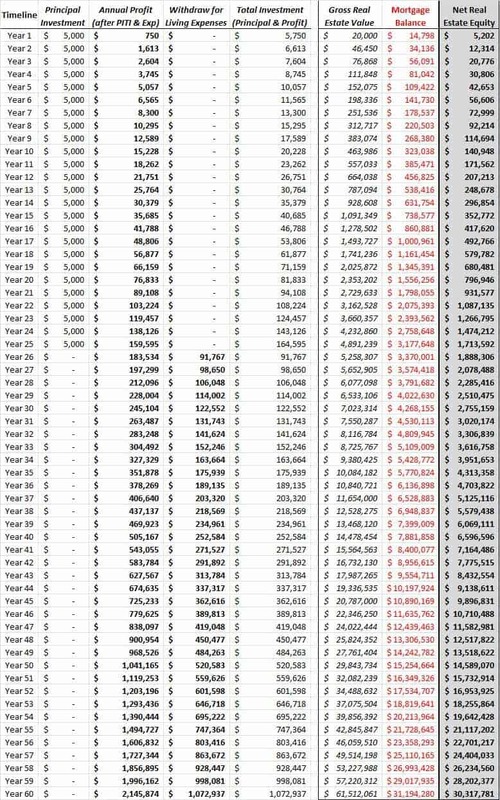 Annual Profit: This is the annual net income you are earning from your real estate investments by the end of each year (the example above assumes you are earning a 10% annual return on your total investment to date). Withdraw for Living Expenses: This is the amount you are pulling from your Annual Profit to cover your living expenses (or to spend wildly on whatever your heart desires). Total Investment: This accounts for your annual Principal Investment PLUS the sum of your prior year's annual profit minus living expenses (i.e. – your total investment/reinvestment into new rental properties each year). In order to create this kind of calculator, you really have to streamline things a bit – but even so, it doesn't necessarily mean the calculations are unrealistic. For example – if you can't consistently find a deal each year that requires exactly $5K of new money – perhaps you can find one deal every other year that requires $10K? Perhaps you can find one every three years that requires a $15K injection? The chart above certainly oversimplifies the formula, but it still points you in a reasonably accurate direction. When I'm looking to retire on real estate, I am focused almost entirely on the cash flow of each property (because this is precisely what is going to pay my bills – now and in the future) but even so, there is FAR more to the story of rental properties than focusing solely on cash flow. A few particularly relevant factors come to mind that should undoubtedly make rental properties a more compelling investment than other conventional retirement vehicles (on paper, anyway). The following factors are pretty commonly known among real estate investors – but I think they're still worth reiterating (because these benefits are rather specific to real estate). 1. 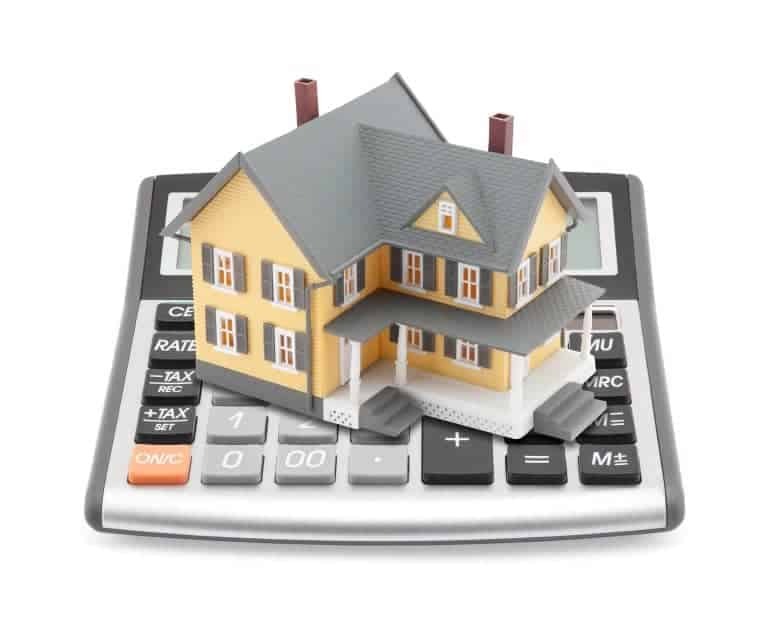 Real Estate Offers Significant Tax Advantages. Thanks to “phantom expenses” like depreciation and interest (assuming you're making loan payments on each property), you are practically guaranteed to pay fewer taxes on the passive income you generate from rental properties. This is a HUGE motivator for many real estate investors. 2. Real Estate Almost Always Appreciates in Value. You bought your property at the right price (i.e. – one that allows for at least a 15% annual cash on cash return). You didn't acquire it during an obvious bubble in the market. You're planning to hold each of your properties for a period of at least 20+ years. In most cases, even if you're unable to check all 3 of these boxes, your portfolio of rental properties is still very likely to increase in value over the course of a few decades (and in most cases, it will increase significantly). 3. The Majority of Your Portfolio will be paid for by OPM (Other People's Money). Probably the most beautiful aspect of rental properties is that in most cases, the investor (aka – YOU) only needs to pay for a small portion of the total value of each property. Conservatively speaking – most conventional lenders will require an investor to cover at least 20% of the purchase price for a single family home and 25% of the purchase price for a multi-unit apartment building or commercial property. Your tenants pay you their rent. The rent payments end up in your bank account. Pay yourself (in the above example, this would come out to at least 15% of the money you originally invested – hence the 15% ROI). If your properties are profitable (which is crucial, btw), there should be more than enough to pay everybody (including yourself) each month. There is no other retirement vehicle on earth that boasts all 3 of these benefits (and each of these benefits is a big deal in their own right). We will be deducting the collective mortgage balances on all of your properties in each given year (so you can see both the gross value and the net value of your entire real estate portfolio during each year). It's a lot of numbers – I know… but there's an important point here. Liquidation Speed: Real Estate is NOT a “liquid asset”. In other words, you should never assume that you can instantly convert a property into cash (whereas, you CAN do this with publicly traded stocks and mutual funds). So, while these numbers for “Net Real Estate Equity” may look impressive, keep in mind that the speed at which you can convert each property to cash will depend greatly on the real estate market if/when you try to sell. Market Value: A property's value (or lack thereof) is seriously contingent on the market in which you try to sell it. There will be times when a property is worth MORE than it was when you bought it, and there will be times when a property is worth LESS than it was when you bought it. With this in mind, the chart above assumes that each property's value has neither appreciated nor depreciated since your original date of purchase. For the average investor, building a huge source of passive income from rental properties is usually not going to be a “fast” process. In order to reach “ultra-rich” status, you need to start sooner rather than later. Cutting your ROI on each property in half (from 15% to 7.5%) will have a significant negative impact on your end result. Changing the interest rate and/or term of each mortgage has a surprisingly minimal effect on the rate at which real estate equity grows. The amount you withdraw for living expenses (and the time you can wait before you start doing this) can greatly fuel or diminish the growth of your cash flow and real estate equity. Throw a significantly larger sum of cash into your real estate portfolio each year (especially in the earlier years). Start withdrawing money to spend on yourself and/or stop investing new dollars into your portfolio (though – once you've consistently invested for 10 – 15 years, this starts becoming a smaller and smaller issue). In the real world – the numbers will rarely (if ever) work out this simply. Nevertheless, this kind of calculator can be a helpful way to illustrate what inputs will be required in order to achieve your desired result. At the very least, it should give you a ballpark idea for what you can reasonably expect to see at the end of your career if you follow your projections until the day you retire. Want to Use My Spreadsheet? If this is something you're interested in – I wanted to make it available to you in a more automated fashion. If you sign up as a REtipster Email Subscriber, you can get instant access to it, right here on the site. 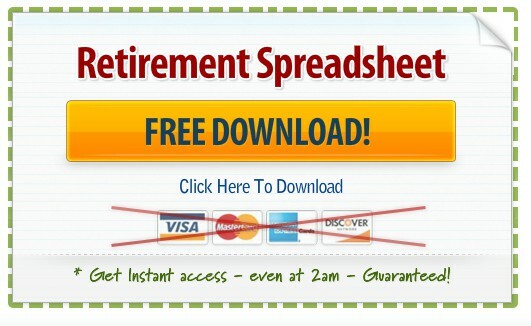 I hope you find it helpful as you're planning your retirement strategy. Best of luck!